Every day, Watch This offers staff recommendations inspired by a new movie coming out that week. This week: Hyde Park On Hudson has us thinking of movies about American presidents. The new Steven Spielberg biopic Lincoln focuses primarily on the passing of the 13th Amendment, which abolished slavery, and the savvy arm-twisting and politicking it took to push the legislation across. 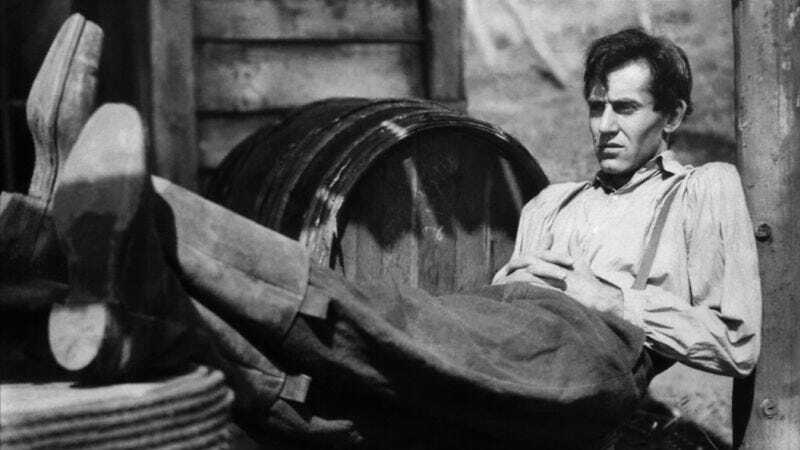 In light of that, John Ford’s Young Mr. Lincoln, a fictionalized account of Lincoln’s humble beginnings as a lawyer in rural Illinois, invites viewers to see him in embryonic form and imagine the shrewd but righteous statesman he would become. Ford’s portrait of Lincoln in those early days is more complicated than it appears at first: There are scenes where he’s the very embodiment of “Honest” Abe, the naïve backwater paragon of decency and virtue, quietly seeking justice against long odds. But then the film has darker hues, too, and the Lincoln we thought we knew turns out to be smarter and more calculating, a future president in the making. Opening in New Salem, Illinois, Young Mr. Lincoln shows Lincoln (Henry Fonda), a clerk at his family’s grocery store, accepting a law book in lieu of payment. After devoting himself to the law, he travels by mule to Springfield and sets up a practice, but when a murder case lands on his doorstep, his inexperience is exposed. There’s a world of difference between the drafting of the 13th Amendment and two brothers accused of murdering a man in a July 4 brawl, but both find Lincoln as the calm center in the middle of a public firestorm, trying to negotiate a reasonable outcome where one doesn’t seem possible. Fonda would become a paragon of virtue in Hollywood films—he did The Grapes Of Wrath the same year, and continued to play upstanding men in classics like The Lady Eve and 12 Angry Men—and, as Lincoln, his lean frame and piercing gaze bring the right stature to a figure whom rivals could dismiss as a rural simpleton at their peril. Availability: Criterion DVD/BD. Accept no substitutes.